The following construction deliveries are scheduled June 27 - July 1 (Monday - Friday), in support of the MWAA Rail Yard and Maintenance Facility project. 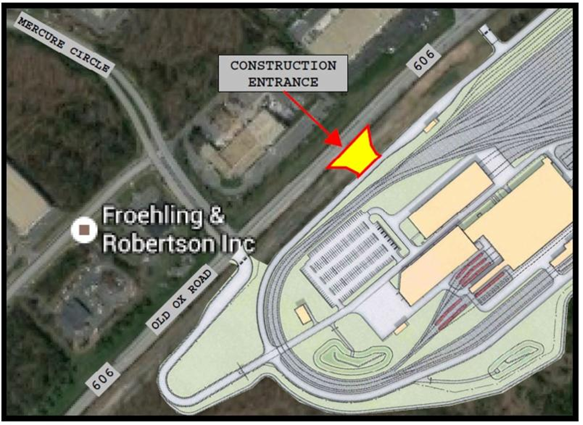 The construction deliveries will be made to the Dulles Corridor Metrorail Project, Rail Yard and Maintenance Facility along U.S. Route 606 (Old Ox Road) and Mercure Circle as detailed below. WHAT: Concrete delivery (5-10 trucks) and concrete pump truck for installation of the Deep Pit Mud Mats at the Service and Inspection Building. WHEN: Wednesday & Thursday, June 29 - 30, between the hours of 8 a.m. and 2 p.m.
WHAT: Delivery of electric manholes (2 ea. / oversized) for electrical distribution system. WHEN: Monday & Tuesday, June 27 - 28, between the hours of 7 a.m. and 4 p.m.
WHAT: Import fill material from off-site location (Leesburg Site). One hundred to 150 truckloads of fill material will be delivered to project site. The imported fill material will be used to replace Unsuitable Material that was found on the project site. All Unsuitable Material will remain on MWAA property and stockpiled. HOW: Trucks will travel from the Leesburg Site (near Leesburg Airport) via Sycolin Rd (Rt. 643), Battlefield Parkway, Dulles Toll Road (Rt. 267) or Evergreen Mills Rd (Rt. 621), Old Ox Road (Rt. 606). Return trip will be Old Ox Road (Rt. 606), Dulles Toll Road (Rt. 267), Battlefield Parkway, and Sycolin Rd (Rt. 643). Roads will be cleaned during import fill operations by a sweeper truck.